It's time to leave familiar climes and tour the wider world! While most Pathfinder characters hail from the Inner Sea region, there are many other continents and societies out there just waiting to be explored. Within this book, you'll find detailed discussions of six major trade cities found on the distant corners of Golarion, complete with full-page maps and information on the resident cultures and traditions, adventure sites, new gods, magic and fighting styles, and more, plus rules to help you add local flavor and abilities to your characters. Face your destiny with a cyclopean myth-speaking, study the mysteries of the Iridian Fold, or hone your magic at the House of Green Mothers—there's a whole world at your fingertips! Aelyosos, City of Tides and westernmost port in the archipelago of Iblydos, whose half-flooded streets are guarded by cyclops prophets and mighty hero-gods. Anuli, City of New Beginnings and ancient gateway between the Inner Sea and southern Garund, where divine matriarchs rule with the mandate of Heaven. Dhucharg, City of Conquest, whose militant hobgoblin generals won't be satisfied until their armies overrun all Tian Xia. Radripal, City of Arches in the Impossible Kingdoms of Vudra, where priests travel the holy Matra River and rakshasas rule through fear and silver. Segada, the fabled City of Keys in isolated Arcadia, whose mountaintop walls keep foreign colonists on the Grinding Coast from expanding into the continent's mysterious interior. Ular Kel, Caravan City and Jewel of the Steppe, where Water Lords and nomadic horse tribes rule over massive trade routes that cut through the Grass Sea of central Casmaron. 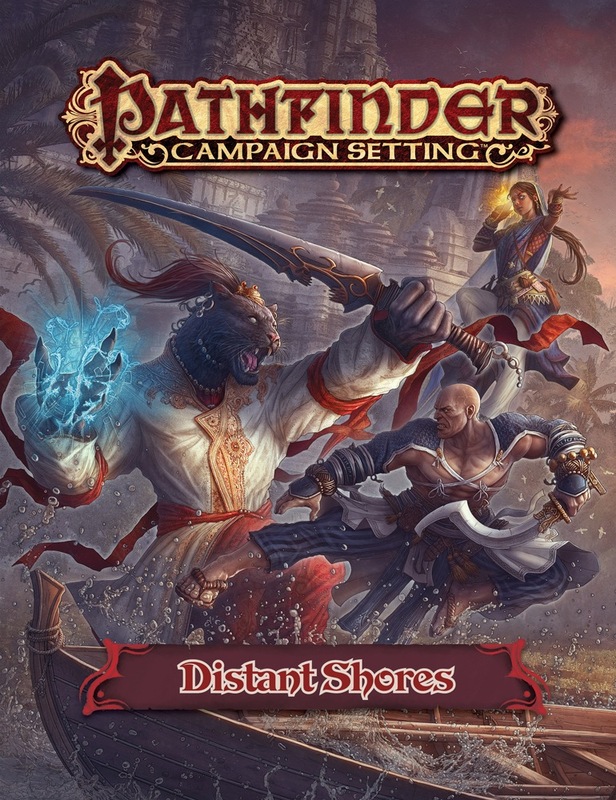 Pathfinder Campaign Setting: Distant Shores is intended for use with the Pathfinder campaign setting, but can be easily adapted to any fantasy world. Note: This product is part of the Pathfinder Campaign Setting Subscription. Only problem is that there isn't more! This material is super difficult to use. Weird way to start a five star review, but there you have it. The reason why I say so is because this book has six great, wonderful, inspiring cities that I desperately want to adventure in, but nothing about their surroundings. So there are a few ways you can use this material: A DM that loves to worldbuild and has the time to do so, can flesh out the nation around the city, thus allowing a campaign to take place there. You could teleport-travel to the cities from afar, from areas better detailed, and then teleport back. You could run the campaign entirely inside the city -- perhaps something like transplanting Hell's Rebels to a revolution in the hobgoblin city of Dhucharg. You could have characters conventionally travel to these cities from nearby areas, but handwave/vague/skim the actual journeys. These are some ideas for how you could use these cities. But it is really important to be aware of this when considering buying this book: they are wonderfully fleshed out cities in the middle of a lot of blank white map. Personally, I don't take off a star because of that, but you might, so that's why I want to be really clear about that aspect of the product. Having gotten that out of the way, let's move on to the content itself. Now, this is six cities, ten pages each. Each has a one-page top-down map for layout, and each has an amazingly evocative two-page wide panoramic shot for atmosphere. Additional graphics include 2-3 full-body NPC shots per city to show important personages or typical inhabitants. Each city has a settlement block (of course), and some new crunch/mechanics. The pseudo-Greek city (Aelyosos) has three new weapons, three new mythic path abilities and two new deities. The pseudo-African city (Anuli) has a new player race (Ganzi, which is to Chaotic as Aasimar is to Good or Tiefling is to Evil), seven new traits and one deity. And so on. The rest of the page count is rounded out by gazetteers of important locations, NPCs, customs and other such flavor material. The six cities detailed are: Aelyosos (pseudo-Greek, with Mythic Adventures flavor), Anuli (pseudo-African, matriarchal), Dhucharg (pseudo-Japanese, hobgoblin-dominated military-flavored), Radripal (pseudo-Indian, with rakshasa intrigue), Segada (pseudo-Amerind, trade hub and entrance into Arcadia) and Ular Kel (pseudo-Mongol steppe city). I'm biased because I'm a huge, huge, massive fan of all settings and environments that break away from the traditional Western European fantasy fare, so this product is tailor made for me. It's like getting to travel the world for twenty bucks. 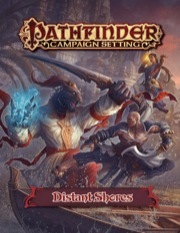 This is easily within my top five Pathfinder supplements, and if you're similarly interested in "off the beaten path" cultures and settings, I couldn't recommend Distant Shores more. Having said that, if your campaign doesn't travel a lot, you're not likely to see a lot of use for this book. Some of the crunch can be brought abroad (like the ganzi player race, for instance) and maybe you want to make a character that has backstory in one of these cities. But this book is very situational. You'll want to think about whether you will have a use for it. My rating is based on taking the book for what it is, and having a use for the niche it fills. As long as you have a campaign where travel is welcome, this book is a five star product. I always love seeing far-off lands of campaign settings described in greater detail. Not only does it give other real-world peoples some much-needed representation, it provides a welcome change of pace from the standard European-based cultures that make up the bulk of so many fantasy worlds. Distant Shores provides a tantalising look at the vast diversity that exists in Golarion. While I know that time and resources make it difficult to fully describe everywhere in the world, I hope that Distant Shores is only the first of several books that will one day explore numerous other regions of Golarion. A lot of the points have already been hit in previous reviews of this product, so this will be somewhat brief and hopefully to the point. Each one of these locations feels a little bit 'clunky' at first read, but when reading for content, and weighing the possibilities of each one of these cities as a 'starting point' for a campaign or world setting, the true genius of each of their designs becomes readily apparent. They work right now really well for home campaigns, even. I can't wait to see a further expansion of Holomog and the nations around it, or Ducharg and how the hobgoblins keep from completely falling apart beyond the capital, or Arcadia and how this unknown continent has been both years ahead and behind of Avistan. With the introduction of Iblydos Vudra, and Casmaron as viable settings as well, suddenly the world of Golarion feels both a slight bit smaller and a *lot* larger. There are a few limitations to such an offering, but they do not detract from the value of this volume, and I would recommend it to anyone seeking to branch out from Tian Xia or the Inner Sea Region! I really enjoyed this book providing information on never before explored corners of Golarion. It provides enough info to build a campaign arc in each location, and each is unique and interesting in its own way. Highly recommended for GMs wanting to spread out to something new for a bit. Distant Shores whets the appetite for more, but gives 6 locations on 6 continents a write up, each chock full of adventure ideas and built in conflict. I particularly liked the evil Hobgoblin capitol city in Tian Xia, and Segada the gateway city to Arcadia. The first because it provides a worthy for for the already somewhat detailed Dragon Empires continent, and the later because it literally acts as a gate blocking the interior of the continent, making it a natural site for colonists and explorers looking to go where none have before (from the Inner Sea at least). Radripal and Ular Kel build upon the scattered lore already seeded in the campaign setting for Vudra and Casmaron, while Aylyosos provides a setting in need of new mythic heroes as their home grown source of them hasn't proven up to the challenge lately. I was intrigued by Anuli, the most Northern city of Southern Garund, but wasn't as grabbed by how to use a primarily stable city run by empyreal worshiping good and honest folk, especially when their primary foil is the necromantic nation of Geb, but Geb already has Nex set up as their primary allies. I can see adding Anuli to the conflict as a strategic ally for Nex, or safe haven retreating from Nex, but I had been hoping for something more exotic for Southern Garund, after the years of hints that the further south you travel, the weirder things get. Overall though, this is a great supplement which stretches beyond the more detailed borders of the primary campaign setting. Announced! Product image and description are not final. One city per place won't be enough to get a proper feel for the larger areas they're in, so I'm kinda disappointed we don't get something more focused on just one of the continents instead. A lot of potential here. Must have Kelesh Empire map (let alone the name of the Kelesh capital). Four of the six regions are named in the blurb. I hope of the three remaining unmapped (greater casmaron, azlanti ruins and sarusan) that the one left out is azlant. 8 people marked this as a favorite. We're keeping the details on each region limited to a gazetteer of a single city for each, so this book doesn't preclude further expansion of any of the areas in question. We didn't need to cram the entire Inner Sea region into Cities of Golarion or Towns of the Inner Sea, and this book will take largely the same format. 11 people marked this as a favorite. Sounds more like a Distant Shores Primer or a Cities of the Distant Shore that a Distant Shores Gazetteer. I'm okay with that, as a teaser for a future expansion, but I'd like to see the name a little more consistent with other titles and what the cover. I doubt we'll be seeing anything on Sarusan, based on statements from James Jacobs. I was beginning to wonder if we'd ever see anything covering these other places. I'm looking forward to this book. Can't wait for October now! Will this book have any details on any new gods? Well, better then nothing at all. Definitely better than nothing. Let's call it a promising start, and hope for more to follow. Yes, I like that, "a promising start", makes me feel all hopeful inside. It looks like a good taste of it. And probably if it sells very well and gets lots of good reviews they will put more information out. Hint at the AP after Hells Rebels taking place outside the Inner Sea Region? Maybe? Light side of Brain: Hey this could be cool and interesting. I will probably get this. Dark side of Brain: "Diverse cultures"? What are they going to take and file the serial numbers off of this time? Oh, yes, this sounds AWESOME! YES! Arcadia... I will devour all of the knowledge you give me on this place. This is great news. One of the few drawbacks to the Pathfinder setting is that the kitchen sink world building approach used for the Inner Sea region results in a maelstrom of cultures and micro-settings washing up on the shore like so much driftwood. An opportunity to create an official Pathfinder setting with a more cohesive style should not be squandered. I.e. it would be nice if the Arcadia, Iblydos, Southern Garund, and Vudra aren't created by stuffing every fictional genre, TV trope, Human culture and societal more into a Blend-tec and hitting frappe'. Please make the micro-regions in new regions internally consistent with regards to each other from a setting style point of view. Furthermore, please apply this philosophy of setting cohesiveness the Pantheon of Deities for the new regions, because the list of Inner Sea Gods look like it was generated by stuffing all the Deities from the Paizo's founders' homebrew campaigns into a bucket and drawing lots. If this proposed setting cohesiveness results in particular creative itches remaining unscratched, then apply those unrealized creative ideas to the currently undiscovered parts of Golarion! Are we going to get some pantheon information for those areas? Bring on the kitchen sink world building approach. Wich continent is Iblydos located on? Part of Casmaron... sort of. It's an island region. It's the Greece analog, in any case, and I believe it's relatively close to its real-world counterpart. Probably due east of Jalmeray, if I had to guess, based on the Inner Sea World Guide's maps. Casmaron. Specifically an island (or more?) to the south(?) that is associated with Casmaron (much like Hermea is part of Astivan, which is the continent to the north of the Inner Sea, i.e. the northern half of the Inner Sea Region). So, of Casmaron, we're getting Iblydos & Vudra. Well I hope Iblydos is the Greek analog in culture/feel as well. So we will be getting a city related to 6 different lands. We have four locations mention and two unknown. We have Azlant, Tian Xia, Sarusan, and the Crown of the World as possible locations for the last two. Woot! And verily, I say again, Woot! Please let the Arcadia entry be an Andoren colony! Please?! That would be fantastic. This book is relevant to my interests. Proceed. I hope the city from Arcadia is not a colony from the Inner Sea but a city of one of the cultures native to Arcadia. I hope one of the cities is from Sarusan. Seconded for a native Arcadian city. We have enough Inner Sea cities. We need a glimpse into the life of the Arcadians, not the colonists.